The Zuni-Bandera volcanic field, in northwest New Mexico, has had many episodes of basaltic eruptions over the last million years (Laughlin et al., 1993). The youngest lava flow in the field is the McCartys flow, which is only 3000 years old, one of the youngest volcanic features in the 48 contiguous United States! The Zuni-Bandera volcanic field has produced many basaltic lava flows, some with a-a characteristics, and some that are paheohoe. There are also a number of well-preserved cinder cones that can be visited, as well as many lava tubes, some of which contain perennial ice. The Zuni-Bandera volcanic field is an excellent site for studying physical volcanology of basaltic magmatic systems. The two images below are a satellite image of the volcanic field, shown on the left, and a geologic map shown on the right. Both images cover about 100 km (60 miles) from north (top of image) to south (bottom of image). 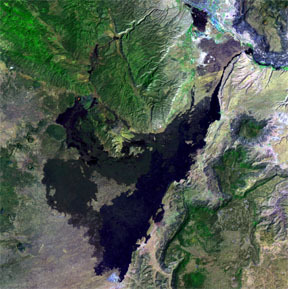 The basaltic lava flows appear as black to grey to reddish-brown areas on the satellite image, and different lava flows appear as different colors on the geologic map. To see a more magnified version of either image, and some discussion of what you're seeing, click on the image. LANDSAT image of the Zuni-Bandera Volcanic Field. 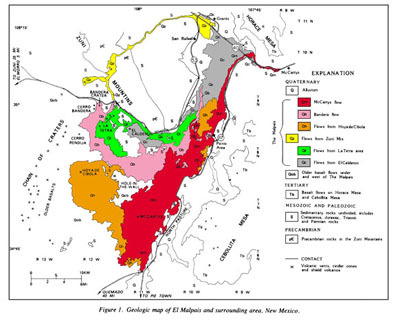 Geologic map of the Zuni-Bandera Volcanic Field. The Zuni-Bandera volcanic field consists of a large number of basaltic lava flow and cinder cones, and exhibits a number of striking features of hawaiian-style volcanism. Pahoehoe and a-a lavas are both represented, along with well-developed lava tube systems. Nichols (1946) mapped and catalogued the geomorphic features of the apparently-young McCartys basalt flow and recognized many features of Hawaiian-style volcanism, including pahoehoe flow patterns, small spatter cones, gas cavities, large wedge-shaped cracks, collapse depressions, large pressure ridges and tumescences. These types of features are also present in other, apparently-older flows, although in some cases are obscured by erosion. At least 100 vents have been recognized in the volcanic field (Luedke and Smith, 1978), and the flows cover a large aerial extent of 2,460 km2. Combined flow thickness is as great as 145 m in some places, and the total volume of all flows is at least 74 km3 (Laughlin et al, 1993). The Zuni-Bandera volcanic field volcanism occurs along the Jemez linament, a zone of apparent crustal weakness defined by a concentration of late-Cenozoic volcanism (Laughlin et al., 1982). The Zuni Bandera volcanic field also occurs in a "transition zone" between the Colorado Plateau, with crustal thicknesses of over 40 km to the Rio Grande Rift where the crust is much thinner. The Jemez linament trends north-northeast, and includes the Zuni-Bandera volcanic field, the Mt. Taylor volcanic field, and the Jemez volcanic field. The Jemez linament apparently has been a long-lasting tectonic feature that penetrates the lithosphere to great depth, and the basaltic lavas of the Zuni-Bandera volcanic field appear to be mantle-derived melts (Laughlin et al., 1982). Geochemically, the lava flows of the Zuni-Bandera volcanic field include both tholeiitic, alkaline basalts as well as minor basaltic andesites and one basanite (Menzies et al., 1991). Observed phenocryst mineralogy includes small olivine crystals, plagioclase crystals and pyroxene. Groundmass contains the same phenocrysts phases, as well as opaque oxides (Laughlin et al., 1972). Feldspar megacrysts, composed either of anorthoclase or oligoclase, are present in some of the alkali basalt flows. These megacrysts can be up to 2 cm in diameter (Laughlin et al., 1974). Perry et al. (1987), suggest that late Cenozoic basaltic rocks from the Colorado Plateau-Basin and Range transition area show isotopic characteristics of both enriched and depleted mantle, and may come from the boundary between these two mantle types. Menzies et al. (1991) suggest that although the chemical composition of the Zuni-Bandera lavas is typical of intraplate volcanisim, and that chemical signatures typical of both enriched and depleted mantle sources are present. The chronology of lava flows in the Zuni-Bandera volcanic field has been difficult to determine due to the composition of the lava flows. A summary of flow ages is given below. For details, see the listed references. For details on the McCartys and Bandera flows, see information below table, or click on links below. Summary of lava flows in the El Malpais area (from Mayberry et al., 1999; Laughlin et al., 1993; Laughlin et al., 1994; Dunbar and Phillips, 1994; Phillips et al., 1997). McCartys flow is the youngest basalt flow within the Zuni-Bandera volcanic field. Its source is a low shield volcano located about 40 km south of the intersection of I-40 and NM-117. A small cinder cone about 8 m high sits on top of this broad shield. Although some of the lava flowed southwestward 8 to 9 km, most followed the preexisting drainage and flowed northward about 40 km before turning to flow eastward 10 km down the Rio San Jose valley. The McCartys flow overlies older basalts of the Zuni-Bandera volcanic field and Holocene alluvium. The McCartys flow is typically a vesicular, porphyritic basalt. Carden and Laughlin (1974) examined chemical and petrographic variations along the length of the flow and reported that within 4 km of the source the basalt is characterized by plagioclase phenocrysts 0.20 to 1.5 cm in length. At greater distances from the source, large plagioclase phenocrysts are absent and olivine phenocrysts are present. Plagioclase is the dominant mineral in samples of McCartys flow. Prior to work of Laughlin et al. (1994) and others, the age of McCartys flow was poorly constrained. Nichols (1946), on the basis of Indian legends and archeological and faunal evidence concluded that the McCartys eruption probably took place after 700 A.D. Since then, accelerator mass spectrometer radiocarbon dates of 2970±60 and 3010±70 years B.P. were obtained on samples of burnt roots. The surface of the flow has also been dated using 3He and 36Cl cosmogenic techniques (Laughlin et al, 1994; Phillips et al., 1997). The determined ages are 2.5±1.1 and 2.4±0.6 ka (3He from Laughlin et al., 1994) and 3.9±1.2 (36Cl, Phillips et al., 1997). The Bandera flows originated from Bandera Crater, a double cinder cone about 150 m high and 1 km in diameter. The eruption of Bandera Crater and its associated flows was the second youngest volcanic event in the ZBVF. Like many other cinder cones in the ZBVF, Bandera Crater is breached to the southwest, probably due in part to local prevailing winds. A large lava tube, intermittently collapsed, extends about 29 km south from the breach in the crater wall and a commercial ice cave is located in a collapsed portion of the tube near the Candelaria Trading Post. Causey (1970) recognized seven stages in the development of Bandera Crater and its associated flows, culminating in the eruption of the black cinders that cap the cinder cone and blanket the hills to the north. Two small commercial cinder pits have been opened in the cinders covering the hills to the north of NM Highway 53 where the cinder blanket is thickest. A variety of crustal and mantle xenoliths and anorthoclase megacrysts have been found in these cinder pits (Laughlin et al., 1971, 1974; Gallagher, 1973). The Bandera lavas are nepheline normative, holocrystalline, microporphyritic and vesicular near the surface. Both aa and pahoehoe surfaces are common on the flows. Five different dating techniques have been used to date the Bandera flows or to constrain their ages: conventional K/Ar, 3He, 36Cl, 14C, and 40Ar/39Ar. Two K/Ar dates (Laughlin et al., 1979) have been obtained on flows that immediately underlie flows from Bandera Crater. These dates of 0.199±0.042 and 0.148±0.87 Ma provide maximum ages for the Bandera flows. These ages were suspected of being too old due to the possible prescence of excess Ar in the samples. Since then, charcoal collected from under the cinders, and presumably carbonized by the eruption, yielded ages of 10.05-10.07 ka (Laughlin et al., 1994). The cosmogenic 3He and 36Cl techniques yielded ages of 11.2±1.1 and 9.5±0.9 ka (Laughlin et al., 1994; Dunbar and Phillips, 1994). The 40Ar/39Ar technique yielded an age of 41±7 ka, probably much older than the actual eruption age due to excess Ar in the samples. In summary, the Bandera crater cinders and lava flows probably erupted around 10,000 years ago.